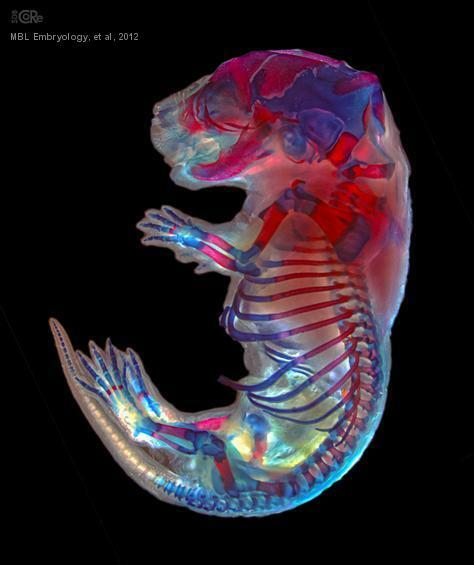 Skeleton preparation of a newborn mouse. Alizarin red was used to detect bone, and alcian blue for cartilage. To ensure that all parts of the preparation were in focus, multiple images were collected at different focal planes and an extended focus image was generated using Helicon Focus software. To maintain as much detail as possible in the lighter and darker regions, mutiple exposures were also collected and processed using High Dynamic Range imaging. Gilbert, S.F. Developmental Biology. 6th edition. Sunderland, MA, Sinauer Associates, 2000. Osteogenesis: The Development of Bones. http://www.ncbi.nlm.nih.gov/books/NBK10056/. Gilbert, S.F. Developmental Biology. 6th edition. Sunderland, MA, Sinauer Associates, 2000. The Neural Crest. http://www.ncbi.nlm.nih.gov/books/NBK10065/. Gilbert, S.F. Developmental Biology. 6th edition. Sunderland, MA, Sinauer Associates, 2000. Formation of the Limb Bud. http://www.ncbi.nlm.nih.gov/books/NBK10003/. Fibrodysplasia ossificans progressiva: a human genetic disorder of extraskeletal bone formation, or—how does one tissue become another?